If you are a first time visitor, coming from Kevin Sites' report...welcome. American journalist Kevin Sites is posting his final report from Syria this week. He has spent a week in the country, filing video reports about some un-seen aspects of Syrian life: clubbing, the border, free-speech and blogging. Although simplistic, his analysis has always been insightful and open-armed. It seems he is trying to show the world the real face of Syria. And he has done a very good job. I will continue to support exciting journalistic experiments like Sites'. He has also filed a series of reports from Lebanon - and he'll be travelling to a number of other 'Hot Zones' during his year-long expedition. In the meantime, he's always welcome back in Syria. Note: he has linked to four Syrian blogs in his article on blogging - including this one. If you are a first time visitor to this site...welcome. Ayman has a comprehensive list of Syria's blogosphere here. Syria making a deal with the US? More reports today of secret negotiations between Bush and the Syrian government. A senior source in Damascus says that the two countries are talking about a face-saving way for Syria to take the blame for the Hariri investigation. According to the leaks, Syria would hand over Ghazli and a senior aide, who would be charged with murder. Bashar and Asef Shawkat would be off the hook and full relations between the two countries would be re-established. Apparently, America is laying down other conditions: an end to the support for Iraq's insurgents and tighten the border. An interesting new condition is that America wants Syria to play down its ties with Iran - if Syria comes back into the international community, it must play the game of isolating Iran. Syria seems willing on all three fronts. But there is also a demand to end support for Hizbollah, which Syria isn't so keen on. The talks are happening with Saudi mediation. But the US Embassy in Beirut denied that anything was happening. Last year secret talks between Syria and Israel were blown out of the water and all ties were cut when they were leaked to the press. In the midst of ancient ruins and modern political drama, Syrian bloggers beat out the rhythms of their own lives. DAMASCUS -- He has glasses and the kind of baby face that relatives probably like to pinch. But beneath the mild exterior of this Syrian mobile phone operator there is some righteous, youthful anger. He expresses that anger in a blog. "I write about everything I'm pissed off about, the things that make me angry: extremism, poverty, religion," he says with an incongruous smile. That's a broad beat for a 20 year old, but Majd (we decide the conversation will be more open with first names only) has a lot to say. "I've got lots of energy inside," he says at a pizza restaurant, where he and two other bloggers decided to meet with me. "I'm very affected by everything around me. When I was young, everything was discussed at our home." His parents were intellectuals and communist party members, he says, and they encouraged him and his sister to question things. Majd hasn't needed much more encouragement than that. His blog, called Hawa (http://hawa3.blogspot.com), Arabic for "air," is written in Arabic as well as some English. And even though he and the other two bloggers, Ghalia and Sara, have made great efforts to emphasize to me they are not political, Majd's blog has already garnered the blogger's badge of honor: enough notoriety to prompt authorities to block access to it. For Majd, this happened at work. "My blog got banned at the office," he says, after he posted "Calm Tsunami," a fable of sorts. Calm Tsunami, Majd explains, is a story about a man and a woman in a relationship. But there's trouble. The woman wants the man to put up a picture of her in his house, but the man says it's unnecessary because her picture is in his heart. The man, Majd says, is the Syrian people, the woman, a government that feels loyalty must be displayed by obvious outward acts, like flying the flag. While it seems a rather tame tale, Majd takes pains to make sure I don't misconstrue his intentions. "I like to make social critiques," he says, "but I have to play with the words." Just as Majd does not wish his blog to be seen as political, nor does he want politics to be the focus of my article about him and other Syrian bloggers. He and Ghalia both say that they are less concerned about government retribution than seeing yet another article in the Western media demonizing all of Syria because of the current political climate over Lebanon and other issues. In fact, misconceptions about Syria are why 23-year-old Ghalia, with a newly-minted diploma in English literature, says she started her blog, Cocktail (http://cocktail4.tk) in the first place. "My cousins are Iraqis who live in America," she says, "but they always looked down on my country." She says she began explaining Syria to them by introducing them to historical Syrian figures, which she eventually turned into her blog. "I want to introduce people to Syria," she says. "I love my country and want to share the things I love." Sometimes it's a hard sell. "There was a British guy that said he was afraid to link to my blog because he thought I could be a terrorist," she says. "But after reading it for a few months I think he decided I was a nice person." Like Majd, she's not afraid of a little social commentary, which she says she usually makes with pictures rather than words -- like a photograph she posted of the newly opened Kentucky Fried Chicken restaurant in downtown Damascus, with a hungry child peering inside at diners. Ghalia writes her entire blog in English, posting four or five times a month. She usually gets only around 15 visitors, which she says is sometimes disappointing. Regardless, she says blogging has changed her life, helping her see beyond her affluent neighborhood, a suburb of Damascus called Malkie. "I thought all of Syria was like Malkie," she says, "but when I started blogging, I got to know my own country. I got out and saw things and was shocked by the poverty." For Sara, a 27-year-old audio engineer, her blog (http://stellar101.blogspot.com) is about sharing her personal journey -- like spending five years at Boston's Northeastern University, but not being able to graduate, she says, because of a post-9/11 U.S. policy restricting student visas. "I felt like I wanted to connect with other people," she says. "I write what comes to mind. I'm not really trying to do anything specific." She says she seldom comments on things that can't be changed, in her view, like politics. But she'll write about religion and women's issues, such as the notion in Arabic culture, she says, that women can't take care of themselves. With her blog, she tries to blend "her Western mind [open and proactive] with her Eastern heart [generous and family oriented]." Blogging isn't cheap or easy in Syria. If you can find a provider, a home broadband connection can cost as much as $80 a month with modem rental and service fees. That's close to the average monthly income of a Syrian with some post-secondary school education. Internet cafes have sprung up around the country, but the most dependable and accessible are those in the capital's affluent areas. Majd says he has a dialup connection at home, which limps along at about 48 kilobytes per second. Still, he spends about three hours a day on his computer outside of work, thinking, writing, sending out dispatches from the hot zone in his head to anyone who will listen. I ask the bloggers if they consider themselves citizen journalists. "I'm not a journalist," says Majd. "I'm not working for specific community goals and I'm not in service to anyone. But I do want people to be affected by what I write. I want ideas to be clarified." "You're reporting about results of actions," Ghalia says to me, of my work. "We're living it. That's what we write." "But what about censorship?" I ask. "Do you feel you can write whatever you want?" "I don't feel any censorship," Ghalia says, "only self-censorship sometimes. I think I want to write things, but then I think they might get me into trouble." "I'd be a liar if I said I'm not afraid sometimes," says Majd. "And my parents are afraid I might be harmed." As soon as he says this, Majd is again uncomfortable that what I write will turn out to be not about the expressions of Syrian bloggers in all their degrees and complexities, but a diatribe about what is wrong with Syria. I try to assure him that they, the bloggers, are the focus of my piece -- but that includes the challenges to their expression as well as the successes of it. At the end of our meeting, Ghalia gives me a two-page letter from another Syrian blogger named Elie, currently studying anthropology in Canada. Due to globalization, Syria is more open than ever. Indeed it is good for Syria, but it demands us to be prudent (there is a price to pay)... The problem is that exchange is one sided. Syria senses acculturation as a raging force. We need you to show the world that we are here. Our message must not be kept hidden, it must not be marginalized, it must also not be omitted because of politics. I want to tell Elie that he doesn't need me to tell the world anything -- that he, like many other bloggers, can speak for themselves, which he just did. And that is ultimately the point of it all. Incredible. Kevin Sites hosts a political debate in Nafaura Cafe in the Old City in Damascus. How many times I myself I have sat here discussing politics. Is this the start of a new Damascus Spring? Some background: Kevin Sites is an American journalist filing a week-long series of reports from Syria. He's produced some excellent material to date...it's all being serialised/re-blogged on this site. Today, he's turned Nafaura into a debating-house. He makes a clumsy observation that some 'mukhabarat' (intelligence officers) were sitting nearby trying to listen. If you know the Nafaura, you'll know that the raised seating area outside is infamous for being the favourite seats of the President's bodyguards. No Mr Sites, not police, Bashar's-bulldogs! Notice how easy it is to discredit an entire anti-Iraq-war argument by saying that the Syrian students were 'watching their words'. He's got some video and photo essays here. Aware the regime is usually listening, Syrian students speak passionately, but carefully. DAMASCUS -- In a tea house just outside the Omayad mosque in old Damascus, Kevin Sites sat down with nine young adults for a candid discussion about issues facing Syria. The students were eager to talk politics, and the discussion touched on the alleged Syrian role in political murders in Lebanon, the war in Iraq and the Palestinian situation. The debate, which Kevin also videotaped, was lively. But it was clear to Kevin that the youths were choosing their words carefully at times. While Syrian culture -- especially the younger population -- is transforming, the regime still maintains tight control through the Mukbarrat, or secret police. In fact, about a third of the way through the interview, a man seated behind the students can be seen on the video, craning his neck toward their table in painfully obvious attempt to listen to the discussion. Whether the man was working for the Mukbarrat cannot be proven, but given that foreign journalists visiting Syria must register with the Ministry of Information, it's fairly safe to assume he was. Watch the video and decide for yourself. A transcript of some of the highlights from the discussion follows (the discussion was in Arabic with the aid of a translator). MAYSA: We wish that our brothers from Lebanon will express their solidarity with us and not quarrel or argue between us and them. We feel they are our brothers although they are making false accusations against us. WALAT: We talked about the forces of the government and the administration but we are not talking about people. Even though they have participated and led this war, we still feel like we have to be brothers to them, you know? Because we feel that like any other people in the world. ABDUL KADER: We are all humans... we are all living in the same universe. KEVIN: Let me ask you this question. Knowing that there is sectarian violence right now, lots of suicide bombings and so on in Iraq, do you believe the American troops should stay until the violence has stopped or should they withdraw now? TRANSLATOR: He wants to just add something about the invasion of Iraq. MOHAMMED: If you want to do things from a different perspective I would say that the administration is similar to somebody greedy walking the street that is very powerful and dominant. He sees somebody who is really stupid but this stupid person has a lot of money. So this guy, this powerful guy would beat him and take the money. Especially if he knows this other man is powerless and would not be able to defend himself. KEVIN: In that analogy, are you talking about the powerful man being America and the weak man being Iraq? ANIS: As for the American war in Iraq, we find it strange that American officials talk about Kurds, Shiites and Sunnis. As ethnicity is concerned we are Kurds and Arabs. And as sects are concerned we are Sunnis and Shia. But either way, the word Arab is absent. KEVIN: You are saying the word Arab is absent specifically for a reason? ANIS: Definitely. They are trying ... to erase the identity of this area and destroy it. In this place the concept of Israel would be more understandable and accepted because there is no identity of the region. WALAT: If the American forces in Iraq really came to complete the humanitarian tasks they've claimed and get the Iraqi people relieved of the tyrant Saddam we will support them 100 percent. They don't do what they've said and now we are really confused. ANIS: We find it really strange that they use the term terrorist to describe Arab people only. Yet terrorism is prevailing all over the world in Spain and Cambodia. And to deal with terrorism, it should be done on the social, economical, cultural level. Not by invading a country to fight certain groups of that country. -Transcribed by Hot Zone Associate Producer Erin Green. Note: Kevin Sites in the Hot Zone believes it is our obligation as journalists to present unheard voices and opinions. Doing so does not imply endorsement or agreement. More excellent reporting from Kevin Sites. Today, we're at Syria's border with Iraq...here's a quote to get you in the mood: " 'The pouring of fighters on the Syrian border has declined now,' said Henry Crampton, a U.S. State Department official quoted in a Saudi newspaper. 'And I believe the Syrians actually took certain measures in that regard, but they can do more.' "
Video and photo essay here. Syria says it's stopping insurgents from crossing into Iraq. So why isn't America convinced? TANEF BORDER CROSSING, Syria -- They are like toy soldiers in plastic poses -- frozen in space, pointing their weapons in the direction of Iraq. It's not that I doubt their intentions, it just seems, well, a bit staged -- for me. There are at least a dozen Syrian soldiers, spaced out about 20 feet apart along a sand berm. They are armed with AK-47s, Russian machine guns and rocket-propelled grenade launchers (though the launchers are empty of grenades). They are silent and still, looking straight ahead, like the stoic guards at Buckingham Palace, even while I crawl around them trying to get the perfect shot in the rose-gold tones of dusk. About a kilometer and a half away, across an expanse of demilitarized, featureless desert, is the Iraqi al-Waleed border crossing point. We can't see it, but a Syrian officer tells me that's where the American and Iraqi troops are. He pantomimes a soldier holding a weapon, carefully stepping backwards while continuing to look ahead. The American and Iraqi soldiers "never turn their backs on us," he says, "no matter who is crossing over the border -- civilians, families, it doesn't matter." On this side of the divide, the Tanef border crossing, this Syrian Army unit knew I was coming. The Ministry of Information had notified them. We also had a government minder with us, a woman named Muna. While they are a bit over-prepared for my visit, I can hardly blame them. This is a sensitive spot. Since the American-led invasion of Iraq, this nearly 400-mile (600 kilometer) border has become one of the most contentious pieces of real estate in the world. The U.S. claims that both Iraqi insurgents and foreign jihadists have used the Syrian border as an entry point to attack American and Iraqi forces, as well as civilian targets. "The Iraqi border is very, very long and it's hard to keep watching it all the time," says Fayez al-Sayegh, the head of Syrian State Television and a spokesman for the Ministry of Information. "Of course there were lots of illegitimate crossings into Iraq but we've taken steps to stop that," says al-Sayegh. "But it's not been proved that many of those [insurgents and foreign fighters] that have been arrested in Iraq have actually come through Syria." The Syrian Army says it's done a lot to beef up security on the border after American and Iraqi complaints, including the creation of a defensive sand berm and increasing the number of border outposts to 557, each with eight to ten soldiers on guard. In an Associated Press report, a Syrian officer identifying himself only as Brigadier General Amin says that his troops have caught 1,400 infiltrators from Arab or Islamic countries so far, and most have been returned home. He added that thousands more have been stopped from entering or exiting Iraq illegally. The U.S. concedes that number of fighters crossing from Syria has decreased recently. "The pouring of fighters on the Syrian border has declined now," said Henry Crampton, a U.S. State Department official quoted in a Saudi newspaper. "And I believe the Syrians actually took certain measures in that regard, but they can do more." The Syrian border has been a wildly volatile area and the effort to secure it has cost the lives of as many as 800 U.S. and coalition soldiers and twice that number of Iraqi casualties, according to coalition commander Lt. Gen. John Vines. U.S. officials also say that Marines and Special Forces units that patrol the border area have been given the latitude to fire into Syria to stop insurgents from crossing. But so far, the rules of engagement don't allow them to actually cross into Syrian territory. Tensions on the border reached their peak last July when several Syrians were killed in a gun battle with U.S. Army Rangers. The Syrian government lodged a protest at the U.S. embassy in Damascus over the incident. The Syrians say they have repeatedly asked the Americans and the Iraqis to form a joint security command to help avoid future problems, but say that so far, their offers have been refused. U.S. officials say that kind of cooperation won't take place until Syria complies with United Nations requests concerning the investigation into the assassination of former Lebanese Prime Minister Rafik Hariri. The initial UN reports claim evidence that both Syrian and Lebanese intelligence officials were involved in the killing. "The American ambassador to Syria refused to go to the border twice," says Ministry of Information spokesman al-Sayegh. "He did not want to witness that our claims of improving border security are valid so he can continue to say he hasn't seen it." A U.S. State Department press officer could not confirm that the U.S. embassy in Damascus has directly received invitations to visit the border. But he did point to a statement by deputy spokesman Adam Ereli for Washington's position. "I don't know what dog-and-pony show the Syrian authorities organize on their borders," Ereli said last September. "But the fact of the matter is ... there are insurgents who end up in Iraq and blow themselves up and kill people ... they couldn't have done it without Syria and Syrian territory playing a critical and necessary intermediary role." So while Syria claims it's doing all it can to make the shared border with Iraq more secure, the U.S. also seems intent on withholding any credit, especially until issues over the Hariri investigation are resolved. It is dark by the time I finish videotaping and photographing the Syrian soldiers at Tanef. It's getting cold and the local commander invites us to have some Turkish coffee and warm ourselves by a stove in a small guard shack. He and the two other officers there have been told not to give any interviews, so instead we chat about their families, and the long separations they endure in their duties. We speak in generalities about the uncertainty of this place and this time. One by one, the "toy soldiers" come off their posts on the sand berm to smoke cigarettes and peer inside the shack where we are sitting, warm and comfortable, wondering what news we might bring. In the second of his dispatches, being serialised on the Syria News Wire, Kevin Sites visits Riad Seif. Seif was recently released from prison, along with a number of other Damascene Spring captives. Seif was a member of parliament at the time of his capture in 2001. Kevin Sites is filing a series of video reports and photo essays - available here. An ex-prisoner hopes to change Syria's political landscape. Will the government let him try? DAMASCUS -- Riad Seif doesn't look like a man who has spent the last four and a half years in a Syrian prison. "I entered prison with a nice smile. It was like going to a party," he says from his home in a Damascus suburb, one day after he and four other political prisoners were released. Why would he consider being jailed like going to a party? "Because I knew it was a difficult decision for [Syrian president] Assad to put me in jail. To take such a decision we must have been really harming them -- they thought we were very dangerous for this regime," he says. "I don't like this regime and I can't say anything but the truth. We are asking for freedom and democracy. When we say something people believe it." In September 2001, Seif, then a member of parliament, and nine other political activists were arrested and jailed in a conservative backlash against an emerging democratic movement that became known as the "Damascus Spring." "Damascus Spring was the hope in our movement for democracy," says Seif. Government officials "thought they killed that hope. They delayed, but they made the movement stronger. Democracy is coming anyway. All that we ask is that it's better to cooperate. To make it less costly." Seif says his prison time toughened him up physically -- he walked or ran ten kilometers every day, losing four pounds -- as well as politically. "Before prison we were very tolerant of the regime, maybe too tolerant, maybe even a little naïve," he confesses. "We thought, 'Mr. Assad is this civilized man, this doctor -- we have to help him move Syria from an authoritarian regime to a democracy as he will seek equal rights for everyone.'" He says he no longer believes that. Seif entered prison a bankrupt businessman; he has emerged as a political force. He's the de facto leader of a nascent opposition, which, if allowed to organize, could present a serious challenge to the embattled government of President Bashar Assad. Seif had been a highly successful businessman in Syria, running an Adidas plant and retail business which, he says, had 1,800 employees and exports totaling over $13 million at its peak in 1994. "In my factory I was very well known for being kind and honest with the workers," he says. "I was the example. I am by heart a socialist." Around the same time, Seif ran for parliament, and won. He began using his position to speak out against the government. That's when, he says, his business starting turning south. He says the government prevented him from importing materials and he eventually went bankrupt. Some time after, Seif says, he was approrached by then-Syrian Vice President Abdul-Halim Khaddam, who is now living in France and has accused Assad of threatening former Lebanese Prime Minister Rafik Hariri prior to his assassination. Seif says Khaddam offered him a deal. The deal was that his business would be restored and become even bigger than before. He could also continue to be an opposition figure -- but that the opposition would be, for all intents and purposes, a fraud. He would need to keep the government informed of what he was doing as well as with whom he was working. The Syrian government has already denied early allegations by Khaddam, calling him a traitor and a liar, in response to his statements about President Assad. Seif says he never responded to the offer and continued organizing what he calls "civil society" forums to discuss democratic reform. After a large forum with a noted speaker, Seif says he was invited for coffee by the Minister of the Interior. Seif says he half-jokingly asked if he was going to be gone for a while and whether he should pack his shaving kit and pajamas. When he arrived for the "coffee," Seif says the Minister was not around, but had ordered Seif's arrest. He was convicted and sentenced to five years for violating the constitution and inciting sectarian strife. Seif and opposition leaders Walid al-Bunni, Habib Issa, Fawaz Tello, and another member of parliament, Mamoun Homsi, were all released last week, seven months before the completion of their sentences. The Syrian government says the early releases are part of a larger plan of democratic reform, although it was done quietly and without fanfare. Western observers say it's a sign that the Assad government knows it is in trouble. But the Bush Administration contends Assad isn't doing enough. "The United States calls upon the Syrian authorities to release immediately all remaining Syrian prisoners of conscience," the White House said in a statement shortly after the release of Seif and his four counterparts. Today Seif looks and sounds like a politician. Wearing a suit and a tie, he is clearly energized by the nonstop phone calls from media wanting interviews and the steady stream of well-wishers: businessmen, intellectuals, and opposition figures who have stopped by his apartment to hear him speak. He says he wants to form a secular "liberal political party" which will avoid corruption through transparency. "I will build a party with some very reliable people -- people with good names," he says. "Our party will be very strict and have only well-respected, moral people as leaders. We will stand on two legs: we will be liberal and free market, but also [moral]." He says their politics won't be influenced by religion, and is confident the party will be hugely successful -- if the government lets him organize. "Our people are waiting for our message," he says, "but we can't even meet." For 42 years, the Syrian government has been run by the Baath Party -- which heads a coalition of nine other legal parties called the National Progressive Front. The Syrian government says a new law is in the works which would allow the creation of new political parties, like Seif's, but so far has not provided a clear timetable of when that will happen. And even though Riad Seif and five others are free, many more political prisoners remain in prison. And there are signs that the "new openness" is a slow work in progress. While Seif talks about the future, human rights lawyer and opposition figure Haitham Maleh must argue for his -- in front of a Syrian military tribunal. Maleh is accused of insulting the president in a letter in which he asked for a presidential pardon on behalf of another defendant. The feisty 75-year-old is used to butting heads with the regime. He's already spent seven years behind bars for his activism -- but he says he can't help it. "I'm 75 years old. I can't turn back now -- it's like heroin in my blood," he says. "I have to continue the defense of my people in Syria." Maleh says the first argument he will make today is that the military tribunal is illegal. "I'm not in the military," he says. Later, during the hearing, the government will argue the tribunal is legal because the insult was against President Assad, who is the commander of Syria's military. "I have to say the truth," Maleh says, "whether they're angry or not." Seif echoes that sentiment as he finishes up with another group of visitors. But he thinks the government will allow his work to move forward. "They are forced to," he says. "Otherwise what is the cost of putting Riad Seif in prison? If they take me to prison again then I'll be a real hero." Thanks to Ayman for pointing this one out. American journalist Kevin Sites is travelling to 'Hot Zones' around the world. This week, he's presenting a series of insightful dispatches from Syria. (Which is apparently a 'Hot Zone' because of the international spotlight focussed on it). In his first dispatch, he visits Mar Mar, a well-established club in Bab Touma. Full video and photo essays here. Watch out for more tomorrow. Some dance, some watch, and most wonder: can Syria shake its "rogue state" reputation? DAMASCUS -- This is probably not what the Bush administration had in mind when it branded Syria a "rogue state": young couples sipping cocktails in a crowded bar, watching others bump and grind on the dance floor to techno, house and funk music. Damascus bills itself as the oldest continuously inhabited city in the world, with people living here as long ago as 5,000 B.C. And there's no doubt, it's still very much alive today. In the old city section of the capital, ancient Arab walls ring a maze of twisting passageways so narrow that pedestrians sometimes have to push their backs up against the cold stone to avoid being kneecapped by cars. And if car bumpers don't pin you, the sound systems will. A black Mazda weaves through the alley, pushing back people with its mass, the heavy bass thump of American rapper 50 Cent popping from its sound system. In a club called Mar Mar, 22-year-old Johnny Kharouf and 21-year-old Rand Sabbagh let loose on the dance floor. They're trying to forget their university studies for a few hours. They're also, they say, trying to forget some of the problems their country is facing right now. Syria, most agree, is in a world of trouble at the moment -- both inside and out. Politically, the government of President Bashar Assad has been shaken by allegations that Syrian officials were involved in the killing of former Lebanese Prime Minister Rafik Hariri and possibly other Lebanese politicians and journalists. There is also a serious confrontation with the United States over accusations that foreign fighters are crossing into Iraq from Syria. And on the economic front, Syria's economy has been staggered by international uncertainty and double-digit unemployment. Kharouf and Sabbagh know Syria has a serious image problem, but for now they need to dance. "I'm like anyone else who cares about Syria," says Sabbagh. "They don't understand us in the West. They think we're all terrorists or we all wear the hijab [modest dress]." In another room at Mar Mar, two women, Nibas and Zeina, drink mugs of beer rimmed with salt. They say they used to go out all the time, even though they're both married with children. But tonight is their first evening out in nearly a month. "It's because of the political situation," says Zeina. "We just don't feel very comfortable coming out. We feel a little guilty having fun when everything is so bad right now." Syria's problems have had a psychological and an economic impact. At the Souk al-Hamediyeh bazaar in the old city, many of the shopkeepers say business has dropped off by as much as 15-20 percent. "The Lebanese use to come here all the time," says a furniture shop owner named Abdul. "Now they're staying away because of the Hariri incident." Syrian boosters are doing their best to draw them back, placing several large banners in the souk, claiming solidarity with the Lebanese people and support for the Syrian President. And as with most of their problems they also blame the Israelis -- in this case, for the murder of Hariri. The United Nations investigation into the Hariri assassination last year says the evidence shows a link to both Syrian and Lebanese intelligence officials. Syria denies any involvement. The UN investigation is even calling for Syrian President Assad to be interviewed. In response to all of the political pressure the Syrian government seems to be pursuing a dual strategy of both defiance and compliance, saying it will cooperate with the UN investigation but not allowing an interview with Assad. The government also recently released five key political prisoners in a gesture it says shows it's moving toward democratic reform. "It's an example of the enlightened policy of openness," says Fayez al-Sayegh, a spokesman from the Syrian Ministry of Information. "From time to time people will be released." Sayegh also says these former prisoners will also be able to form opposition parties, as some have vowed to do, once new guidelines are written. But that openness has it limits. While videotaping in the Souk al-Hamediyeh, I am tailed by the Mukbarrat, the Syrian secret police. When I talk with a group of students in a local tea house, another man, also probably working for the Mukbarrat, cranes his neck in a painfully obvious attempt to listen to every word of our hour-long conversation about all of the issues Syria is facing. Despite all of the current instability and uncertainty in Syria, some Western businesses still see it as a good long-term investment. The Four Seasons Corporation recently opened a 300-room hotel in Damascus and says it will begin an aggressive program of attracting not just business travelers, but European and American tourists as well. And there is even American fast food. The local management of a recently opened Kentucky Fried Chicken outlet in the new city say that business is good -- but they still want to keep a low profile. They don't advertise, and they declined to be interviewed. Back in the old city, some young Syrians will dance and drink until daybreak, losing themselves on the dance floor or in the shadows of the passageways that have existed for thousands of years. In a quieter place, high above the city on the road up Qasiyun Mountain, people park their cars, walk to the edge and look out over Damascus. The lights of the city, both old and new, sparkle over a huge expanse below. It is, in some ways, similar to looking at the night sky, knowing the starlight you see has traveled so far a distance that you are actually looking into the past. For Damascus and the country as a whole that past and present seem to exist together, lingering clearly, but still not providing any clear idea what the future holds. In the past few minutes, the UN Security Council has placed an astonishing set of demands on the Beirut government. First it wants the government of Fouad Siniora to disarm Hizbollah - something he said he will not do. Second it wants the Syria-Lebanon border to be closed. The UN wants to halt the flow of arms and people across the frontier. (Until now, there had been no mention of a problem of arms coming from Syria - in fact, the Syrian authorities caught a number of Lebanese near the border smuggling weapons into Syria - Lebanon is a much more heavily armed country). Third, it wants Lebanon to set a date for new presidential elections. It comes just weeks after US Secretary of State Welch visited Beirut and demanded that Hizbollah be kicked out of government. 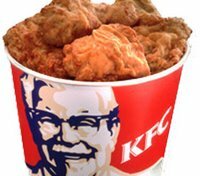 American fast-food chain Kentucky fried Chicken has opened its first branch in Syria, despite US economic sanctions preventing it. It comes just months after Coca Cola and Pepsi took advantage of Syria's economic liberalisation. Previously American goods had to be smuggled in from Lebanon. The Damascus KFC is owned by a Kuwati - Nasser Khourafi - who is also building a Sheraton hotel in Aleppo. Kuwait and Syria have been strengthening their economic ties in recent months. Syria has called for a Hariri-like UN investigation into the death of Yasser Arafat. Bashar accused Israel of assasinating him, in a speech on Saturday. There were persistent allegations of sabotage - most likely through poisoning - a year ago. And his cause of death was never clear. Meanwhile, Israel says the Tel Aviv bombing was planned in Syria. Defence Minister Shaul Mofaz labelled the meeting between Iran's President Ahmedinijad, and Bashar as a 'terror summit'. Despite the frosty atmosphere, Bashar repeated his call for peace talks with Israel. After all hope was lost. After 5 years and little change. After international pressure strengthening the hand of the old guard. Finally, Bashar is to relaunch his reform program. But there have been false dawns before. And today is different: with US tanks on the Syrian border, and unprecedented domestic attacks from key Syrians like Riad Seif and Abdul Halim Khaddam calling for Bashar's overthrow, is anything going to change? This weekend's reforms - the first talk of real liberalisation since 2001 (ignoring the party conference) - includes making it easier for other parties to get involved in government, and politicise more Syrians. It's not clear whether the Muslim Brotherhood would be involved - but Bashar has been making concilliatory sounds to them in recent years. Astonishingly, human rights group Amnesty International have been allowed back in to Syria for the first time since 1997. One of their conditions of operation is that they can operate freely, so it'll be interesting to see what they report. It's an unusual time to liberalise domestically. The prisoner releases were hailed as a way of getting the government's opponents to rally round the 'national cause' - unity not plurality. 5 years ago Syria thought all its dreams had come true. It came crashing down 18 months later. Is this Bashar's last chance? There are many roads that lead to Damascus. There's the one from Jordan to the south, which passes near Ezra - whose sixth-century Church of St George contains the supposed remains of that obscure Roman soldier, Christian martyr and patron saint of an England he never knew. Then there's the road from the north-west that goes down from Beirut and the eastern Mediterranean coast and then through the anti-Lebanon mountain range. Nearby lie the summer resorts of Bloudane and Zabadani - convenient places of refuge in the months when Damascene lungs struggle for fresh air. The mountains where Syria, Lebanon and Israel meet and compete along their borders seem a natural boundary. But, for the great majority of Syrians, those lands to the west - the old Palestine - remain what they were before the cartographers of the great powers drew their lines in the sands and across the mountains in 1919. This for them is still the greater Syria. But it's the road to the east - the one linking Damascus with Baghdad - which provides the most revealing prospect of Syria then and now because it's the one that gets you inside the skin of that old Middle Eastern condition - the relationship between the desert and the city, between ancient solitudes and civic bustle. Nowadays, that road is a busy one - a real military highway crowded with grinning Syrian soldiery packed tightly into trucks and jeeps that speed their way to and from the border with Brittanic-American-occupied Iraq. Syria is one of the most militarist societies in the world; most of the country's GNP is spent on the army. But the militarism goes deep into this sand and soil. Turn left, head north, and you'll find yourself in the ruins of Palmyra - whose ruling Queen, Zenobia, gave the Roman army a run for its money in 268-272 before the emperor Aurelian got to grips with the threat and crushed her army. The straight and ugly highways that cut their way with brutal efficiency through this desert landscape started as trade routes, and there's still a need for water supplies to be driven along here in the summer months. Leave Damascus some two hours before sunrise, drive as furiously as the desert wind itself for two hours, and then there's a chance to catch for a few minutes the dislocating vision of the rising sun contained in one disc of fire hovering over the desert scene. But loiter too long and there'll be an investigative motorbike on its way with some soldiers from the nearest concealed watchtower. My own detention at the military base lasted at most two hours: the guards were both amiable and bored as they got up from their fly-infested beds to make the phone call to the Ministry of the Interior which would establish my innocence. But it was a reminder that in this society the desert is not an escape from the city - it is and always has been a part of its structures of power. Most journeys from Britain to Damascus will start in the chaos and delays of the airport, where Saudi businessmen display a cheerful contempt for queuing before heaving their huge frames into the waiting Merc. With formalities eventually over, in less opulent and bribable instances, the jump into a cab or bus will get you into the outskirts of what claims to be the earth's oldest continuously inhabited city. Jericho and Aleppo make their counterclaims, but since we're talking about origins lost in 6,000 years of history the debate is one that's unlikely to be resolved. Besides which, of these three cities, Damascus is clearly the place that still matters most. The mixture of Jews, Christians and Muslims has been the deepest here and the whirl of Greek, Roman , Persian, Byzantine, Arab and finally French cultural tides has been almost as dizzying in its effect as the revolving dances of those dervishes who were once so important in Syrian culture. The drive into Damascus reveals a scene much like that of any other large Middle Eastern city - dust and smog in the summer, but a chilling wind in the winter; cafes full of men smoking, ugly high-rise developments, carts full of fruit and vegetables threading their way through gas-guzzling cars, the gesticulation of haggling shopkeepers, a lot of animation. But also in this instance, an underlying listlessness and a wariness. Stuff happens in the New City - the area developed in the late 19th century during the Turkish colonial period - because this is where the rural population has migrated in huge numbers as the country's birth rate has continued to soar. Around Yousef al-Azmeh Square, and especially after sunset, the scene is alive with Syrians smartly dressed for the evening display. But the New City also contains the offices of the government bureaucracy, that elite which is now taking the measure of its new and untried leader Bashar Al-Assad, whose weak-chinned presidential features stare blankly out of the photo frames that hang in the shops of the souks, in restaurants and above desks. An ancient society like this one is well versed in the cynicism of power and its shifting cycles. And when you get finally inside the old city, there's a real sense of how and why Damascus has been able to survive by adapting itself to all those shifts of revolving time. At the centre, there's the Umayyad Mosque, one of Islam's great architectural glories. It may be bit tatty at the edges, following the restoration needed after a 19th-century fire, but this is substantially the same building that was raised in the early eighth century when, suddenly, Damascus shot to greatness as the seat of power for a world made by the followers of the Prophet. Mohammed had been a man of the desert but the Umayyad dynasty centred in Damascus established a cosmopolitan cultural style across the lands they had conquered, including Persia to the east. Just to the side of the mosque is the tomb of Saladin, chivalrous conqueror of the Crusaders, who died here in Damascus in 1193. But turn back to the mosque and look at its lower walls, and it's clear that the stones here are different from the ones in the rest of the building. For these are the remains of the Romans' temple of Jupiter, a compound that was turned into a Christian church sometime in the late fourth century but then handed over to Islam by the eighth century. And if you look at the mosque's mosaics, it's clear that it was craftsmen from Greek-Catholic Byzantium who were imported to do the job of decorating to the glory of Allah. There are distractions as you journey along these cultural sights, and a lot of jostling from sharp-elbowed Shiite women who now arrive in their busloads from Iran as well as from Iraq. The head of Hussein, son of the Prophet's son-in-law Ali, and founding martyr of Shiite Islam, is in a tomb inside the mosque and attracts a lot of jabbering onlookers. And another head, that of St John the Baptist, seems quite popular too, judging by the money and pleading notes left by the side of the monument. But money changes at an even greater speed in the surrounding souks, especially in the Hamidiye Souk, which was originally a Roman road but, having been recreated only in the 1870s, now parades a rather fake antiquity. There's a more genuine feel to Straight Street (Madhat Basha Street), which lies to the south of the mosque and is crowded with shops, both touristy and more unusual. It started life as a Greek road before being turned by the Romans into their Via Recta and it's along here that the blinded Paul found lodging at the house of Judas, before escaping in that famous basket lowered down the city walls when his gospelling got too vigorous and angered the local Jews. The US's latest diplomatic cruise missile has just hit Syria's former head of Military Intelligence, Asef Shawkat. They've frozen all of his assets in the States. All US banks must block access to his accounts, and no American is allowed to do business with him. He's accused of supporting terrorism in Iraq, Palestine and Lebanon. These accusations come from his support for Hamas and Hizbollah (I wonder if that makes US-poster-child Rafiq Al-Hariri a terrorist too - he supported Hizbollah at various times in the late 1990s). In June the US froze the assets of Interior Minister Ghazi Kanaan (who later commited suicide) and Rustom Ghazleh (Syria's Military Intelligence chief in Lebanon). Revealingly, the US accuses him of being resposible for 'Syria's terrorism': "Today's action is a significant signal that those like Mr Shawkat who support Syrian terrorism will be held to account," said Scott McClellan, the White House Spokesman. But Bashar still hasn't been personally penalised - is this a signal that America holds members of Syria's inner circle guilty of Syrian terrorism, without pinning the blame on bashar himself? Is this Bush's way of leaving a door open for rapprochement with Bashar. Shawkat's money and property in America has been frozen because of his "links to terrorism" in Lebanon and Iraq. The Syrian government has intervened to release two prominent Syrian opposition activists. Riyad Sayf and Mamun Homsi were two of the leaders of the Damascene Spring, ushered in after Bashar became President in 2000. They were arrested in a crackdown by the old guard a year later. The release comes just 2 months after the government set 190 political prisoners free. In the last prisoner release the government made an accompanying announcement saying that it was taking this step to 'forment national unity' - a thinly veiled way of saying it wanted to bring the opposition into its bosom. The question many Syrian activists are asking now is how many more political prisoners are there to be released? Every morning, Nahid Badawiya, an engineer, and her husband Salama, a writer, enjoy a quiet start to the day. In their modest Damascus apartment, they look like an ordinary couple, but they are part of what is left of Syria's secular opposition. Over their morning coffee, they talk democracy and freedom of expression - radical subjects in this often repressive country. Nahid still remembers the day 15 security agents picked her up from her parents' home in 1987. Still a university student, she spent four years behind bars for being a communist under Baath party rule. Three months after she was released, Salama was thrown in jail for eight years. After he was freed, it was too late for them to start a family. Despite everything they went through, they decided to continue focusing on their political work. "If the regime had allowed others to participate in the decision-making process, Syria wouldn't be here today," Nahid says. "I feel that we're going back to the 1980s, when the masses were mobilised around the state and repression was at its worst." "I don't think that what I and my colleagues do has much of an impact, but I will continue to try to bring about change, if only to set an example for the younger generation." Nahid says many Syrians are disappointed by President Bashar al-Assad's failure to deliver on his promises five years ago to bring reform to the country. To make things worse, the government could now face sanctions if it does not co-operate fully with a UN investigation into the murder of Lebanon's former prime minister, Rafik Hariri. A report based on the findings of the investigation has already implicated top Syrian and Lebanese officials, but Damascus denies any role. For the first time, the Syrian leadership now also faces a challenge of some sort to its grip on power. Syria's former vice president, Abdul Halim Khaddam, recently announced he was planning to form a government in exile as he launched a scathing attack against the Syrian president. Today, for millions of Syrians like Nahid and Salama, life is made up of daily frustrations, fear and uncertainty about the future. They feel their fate is the hands of the rich and the powerful, who have had a four-decade-long monopoly on power. Across town from the Badawiya household, Firas Tlas comes home to his wife and five children after a day running his business empire. He is the son of a former minister of defence, who held his post for 32 years and was a close aide of Mr Assad and his father, Hafez. Mr Tlas insists he is not part of the ruling elite but acknowledges he has had a sheltered life. "It's true to say that I had opportunities as the son of Mustafa Tlas. People helped me but I didn't take advantage of the name," he said. Mr Tlas believes reform is needed in Syria but maintains it can be done from within, even with people who have been power for decades. "Mahathir Mohamed was in Malaysia for 25 years and he made reform. What you need is a good time," he added. "Maybe some Syrians see me as part of the problem; maybe others see me as part of the solution." Many ordinary Syrians do wonder how much real change people like Mr Tlas could bring to the country, and they doubt that any pillar of the Syrian leadership, past or present, really wants to implement reform. Still, a challenge to the government could come from within, as shown by Mr Khaddam's moves. During this time of transition for Syria, one voice is rising above all the others. For decades, the Syrian government ruthlessly crushed Islamist movements. But today, let down by the state, unemployed, increasingly poor and living in a country under intense international pressure, many Syrians feel religion is the answer. "When you have a good relation with Allah you will feel very comfortable. I am not afraid of the future. Allah helps us at this time of pressure," Layla Sharaf al-Din says, as she helps young girls memorise the Koran in a Damascus mosque. While the move towards religion is widespread across the region, in Syria it is a phenomenon to be watched closely. A growing number of people are going to the mosque, more and more women wear the veil, and the conservative Islamic dress that has women completely covered - including their faces and hands - is also spreading in certain circles. It is all a sign that things are in changing in a country that is meant to be socialist and secular. The various segments of this very diverse society are now all looking ahead, wondering how they will fit into Syria's future. While the ruling elite worries about losing out if change does occur, the secular opposition and the conservative Muslims are hoping to be the beneficiaries of that change. Meanwhile, President Assad is working hard to weather the storm and stay on top. One day after France signalled that he was no longer welcome, former Syrian Vice President Abdul Halim Khaddam has announced he is forming a government-in-exile. The news contradicts his insistence that his words against Bashar were not a bid to seize the Syrian leadership. The man who was one of Hafez's closest aides for 30 years expressed his confidence that Bashar would not see out the year as President. When Hafez died in 2000 there was said to be a behind-the-scenes power struggle. Old hands like Khaddam, Foreign Minister Farouq Ash-Sharaa and boss of Lebanon Rustom Ghazleh were said to be angry that the inexperienced Bashar was being drafted in. They felt the Presidency should go to one of them. The front runner? Vice President Abdul Halim Khaddam. France is desperately trying to get rid of former Syrian Vice President Abdul Halim Khaddam, it emerged tonight. A delegation of French diplomats arrived in Saudi, to arrange for him to be transferred out. Saudi said no. The French delegation immediately went across to the UAE - it's not clear what their response is. It seems that after Khaddam's stream of inflamatory statements, France does not want to be stuck in the middle anymore. Chirac, a long-time friend of Syria, has been frosty towards President Bashar Al-Assad, but it seems hosting Khaddam is a step too far even for him. Interesting, too, that Saudi is refusing to let Khaddam in. Oh to be a fly on the wall of the King Abdullah-Bashar talks last week. Former Vice President Abdul Halim Khaddam went on British television (Sky News) today to make that statement. The wild claims would have got top billing on the news two weeks ago, but the slow drip-drip effect of Khaddam's comments are becoming as monotonous as another bombing in Baghdad. By next week, Khaddam's statements will have about as much credence as a SANA press release. Is Bashar about to agree to be interviewed by the UN? The UN confirmed that they received a reply to the request to interview Foreign Minister Farouq Ash-Sharaa and President Bashar Al-Assad. That reply confirmed that Syria is willing to let the UN meet Sharaa. There was no mention of Bashar. Days later Bashar told an Egyptian newspaper that allowing the UN to interview him would 'violate Syria's sovereignty'. On Sunday the Saudi Foreign Minister - a close friend of Lebanon - unexpectedly arrived in Damascus, and took Bashar to meet King Abdullah in Jeddah. After the talks the two countries issued a joint statement saying that Syrian-Lebanese ties need to be stregthened - typical Arab League padding. But the real crunch came in comments made by Bashar. He would let meet the UN 'if there is a legal basis for the interview'. This sounds very much like a face saving way for Bashar to meet the UN. Former Syrian Vice President Abdul Halim Khaddam has admitted that he wants to overthrow Bashar's government. But he still insists he doesn't harbour any intentions of becoming President. Don't forget, Khaddam was President in the interim period between Hafez's death and Bashar's appointment. There was said to be much wrangling behind the scenes, with many thinking Khaddam - who had been at the top since the very begining - should be made president over the inexperienced son. Bashar also revealed that Khaddam was plotting while still in office just before being ousted six months ago. In revelations more suited to Kuwaiti gossip-rag As-Siyassiyah than a man who was the second most powerful person in Syria until six months ago, he also says he wants Bashar to go to prison. He accuses him of being personally responsible for Hariri's death. But even though he says he wants regime change, he says that he is totally opposed to external help - i.e. a US invasion. Interesting then, that he has chosen exile in France not the US. Does this signal something about France's intentions? It is also very interesting that the US has stayed utterly silent (apart from a couple of John Bolton utterances) for the past couple of months - I find it very difficult to accept that they still haven't used the Khaddam affair to their advantage. Meanwhile Khaddam says he has been interviewed by UN investigators over allegations he made that Bashar threatened Hariri. Bashar says there's no way Khaddam could make such claims because there was no one in the meeting apart from Bashar and Hariri. Khaddam was a close personal friend of Hariri, as well as being a regime hardliner and member of the old guard linked to Hafez's brutality. He opposed Bashar's reform, and sucessfully blocked Bashar from bringing non-Ba'ath politicians into government. To understand the Khaddam flare up, it's necessary to understand the Khaddam-Hariri-Saudi-French connections. Josh Landis has a useful analysis. And in the coming days I am planning a backgrounder on the whole 'Hariri year'. Khaddam insists he still has more 'revelations' - it promises to be an exciting year. FLASH 19.42: Syria has agreed to let the UN interrogate Foreign Minister Farouq Ash-Sharaa. It is still considering a request to question President Bashar Al-Assad. Syria's former head of military intelligence in Lebanon says he is ready to quit if Bashar asks him to. He was implicated by the UN investigation in the murder of Rafiq Al-Hariri. Earlier today rumours spread around Damascus that Ghazleh had committed suicide - but then he made this astonishing statement. Syria now admits it has received a UN request to interview President Bashar Al-Assad and Foreign Minister Farouq Ash-Sharaa. Until now, they had been denying that they received an official request. The demand was made public by the UN yesterday. When the commission asked - far more informally - to meet Bashar last year, Syrian judges refused, saying it would amount to an attack on Syria's sovereignty. Syria has not said how it will respond to the demand, but they are saying that the interview request is a direct result of Khaddam's bombshell on Friday. The former Vice Presdient of Syria claimed Bashar threatened Rafiq Al-Hariri. UN investigators studying the Hariri killing have demanded to meet Bashar Al-Assad. The inquiry's demand - which was led by Detlev Mehlis - comes just days after former Vice President Abdul Halim Khaddam made an extraordinary statement from Paris that Bashar threatened Hariri. The UN say they've already submitted the request to Syria, but Syria says they only know about it from reports on TV. "We asked to interview Assad, [Foreign Minister Farouq] Shara and others. We are awaiting an answer [from Syria]," UN inquiry spokeswoman Nasrat Hassan said. She also said they want to meet Khaddam as soon as possible. The UN previously demanded 5 top Syrian officials meet investigators. Syria made its own demands, and then said yes on the day of the deadline. It is unclear whether the UN will again demand that the witnesses are interviewed in Beirut. Abdul Halim Khaddam, who was Syria's Vice President until June 2005, has been expelled from Syria's ruling party after his rant on Friday. Syria's parliament spent most of yesterday condemning Khaddam's revelations. Some parliamentarians called for him to be tried for treason. It is, of course, all to be expected. "1970: Haffez Assad comes to power after a military coup. Khaddam is there. 1978-1986: Massive raids and strikes and arrests against ALL political factions of Syria, from the very very Left to the very very Right wingers. Syria having its WORST days regarding individual/public freedoms since the Ottoman occupation. of course he was here. serving us his best! 1986-mid 1990s: Syria having its WORST economic situation since the Ottomans. Of course he was here STARVING with the people, and waiting in line for a piece of bread. 2001: a crack down of newly emerging political freedoms that resulted in the arrest of Damascus Spring symbols...among them MP Riyad Seif, Professor Aaref Dalileh, MP Maamoun Al-Homsi. Of course, he was lecturing about democracy then. Murderers like Khaddam make the News...No Mr. Khaddam, you're not a part of this Nation...and you're no better than any of the regime left here, if not WORSE than most of them...you're of those people who cold bloodedly bombed a CITY...a Syrian City with Syrian INNOCENT ppl living there...Hama"
*The villages around Lattakia are, of course, an Allawi stronghold.